Taekwondo, I'm sure you've heard of it. The origin of taekwondo is of course, Korea. 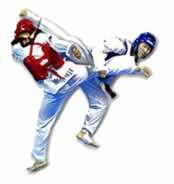 Taekwondo Korea has now become very popular in the world of martial arts. Taekwondo is a martial art focused on kicking. Tae (태) means "to kick" or "to strike with the foot." kwon (권) means "to intercept" or "to strike with the hands." do (도) means "the way of the art"
As we put these together, we can clearly see Taekwondo is the way of the art using kicking and punching. Taekwondo has become very popular and well known for its excellent kicks. Besides the use for self-defense, taekwondo has also become very popular as a sport. There are many taekwondo competitions all over the world. It is even an event in the Olympics now. In addition, taekwondo teaches more than physical fighting skills. It teaches discipline as well as a way to enhance daily life through training. To learn more in-depth about taekwondo, please use the links below to find specifics about taekwondo. Big Bear Academy Martial Art Hall of Warrior Training has the information, resources and knowledge to enhance your warrior street combat self defense and martial art training Journey! Fitness Programs for Life can help you learn how to get into The Zone and take your martial art to a higher level. Shaolin Kung Fu for Life is one site you should not miss. I have personally trained in Shaolin Kung Fu and cannot emphasize enough how useful some of the knowledge can be, for any martial artist. Studying various martial arts and the different philosophies is a must for any true practitioner. Muay Thai Warrior offers top muay thai boxing techniques, training tips and information.